Tips on making your call center a genuine profit center. As with all the famous DUMMIES books, this practical, user-friendly guide outlines how to improve measurable results, set-up an operation, lead people successfully, and balance revenue generation, operational efficiency, and customer satisfaction. This 2012 edition addresses many industry changes, such as the new technology that’s transforming today’s call center and the location-neutral call center. It also helps readers determine whether it’s both efficient and effective to outsource operations, and looks at the changing role and requirements of agents. 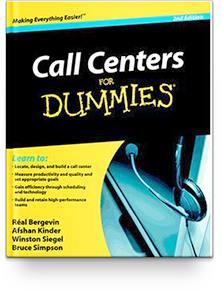 With the latest edition of Call Centers FOR DUMMIES, managers will have an improved arsenal of techniques to boost their center’s bottom line. ** Many thanks to Real Bergevin for his original version in 1999 and handing over the reins to us for this one. Purchase this book!...for yourself or your whole team!